One of my best bicycle tours so far: Being a typical English man writing a review is not something I would normally consider doing, my national tradition is to either enjoy and keep it to myself or have a bad experience and moan about it to anybody who will listen but after a recent trip to the warmer, sunnier climes of Almanzora in the province of Almeria in Spain I decided to make an exception and write about my experience. It was here I undertook a long weekend at the end of September splitting the skin at the back of my calves and attempting to break the world land speed record whilst strapped to my hired On One mountain bike hurtling down Spanish singletrack with my wonderful girlfriend also a complete novice. Our trip was booked last minute after stumbling across the mountain biking Spain website whilst looking for destinations in Spain, after a quick browse through its contents followed by a short Skype conversation our trip was arranged.A short hall flight from East Midlands to Alicante and we were in Spain, our transfers were taken care of (around two hours of motorway driving) by our hosts, both of whom had made the effort to travel to the airport to greet us for our early morning arrival. The accommodation was exactly what we had hoped for, a clean, tidy, comfortable biker friendly house just a short distance from our hosts own accommodation. Mountain biking Spain is located on the edge of and above the quaint Spanish village of Almanzora , the village itself only a short walk from our accommodation consisted of four welcoming bars that turned out to be the perfect watering holes at the end of a days riding, a small bakery (much like someone’s front room) which baked an incredible Spanish loaf, and a well stocked supermarket. During our stay our hosts also offered to take us to the close by town of Albox. 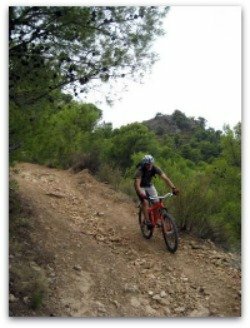 Although my partner and I were quite fit we were complete novices when it came to mountain biking so we booked a single day skills training to get us started. This would later prove to be invaluable and Vic who has the patience of a saint soon had us riding down and over things that only a couple of hours before we wouldn’t have thought possible. Over breakfast on day two chatting about fitness and skill levels our guides recommended we should try and ride the descent known as “gone in eight minutes” unfortunately for us to get the trail head involved climbing “Master and commander” a brutal 2.5km climb that had us off the bikes walking, gasping for breath on several occasions. On arrival at the top we were treated to some truly amazing views of the surrounding area along with some of Einats delicious home made energy bars to refuel our spent bodies. The descent itself was an exhilarating plummet through wooded singletrack with steps, small drops and testing steep sections where my eyes widened and my knuckles whitened as I tasted the rush that Vic call proper mountain biking. The next two days continued in similar vein, climbs which at the time seemed to never end always followed by amazing descents which never failed to have us grinning and buzzing with excitement at the bottom. At the start of our third day we visited the village market which although only very small gave us a chance to buy fruit and vegetables grown locally. This wasn’t the perfectly shaped produce that you find in the UK but misshapen, not at all uniform or pleasing to the eye. We found ourselves experiencing vegetables that tasted somehow different, more like vegetables are supposed to taste. We also purchased a spit roast chicken and a large bag of olives also grown locally. The Spanish here really do love their food. 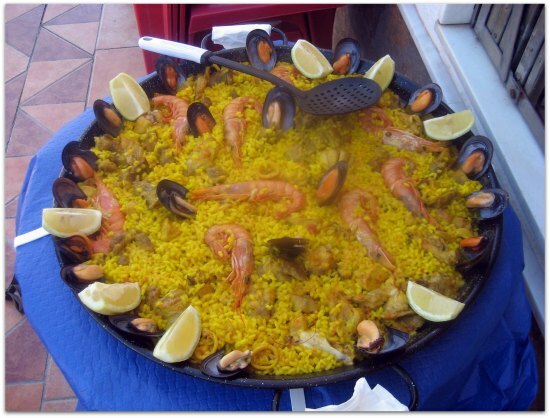 On our final night our hosts arranged for us to have paella in one of the village bars, this is a treat not to be missed if you visit and along with the local vino was the perfect end to our long weekend break. In all we experienced some fantastic hospitality in what can only be called real Spain, we had three brilliant days riding in an area nothing like the major tourist zones that most Brits love to hate. We shared our BBQ with lizards, our bike rides with eagles and our enjoyment with each other. 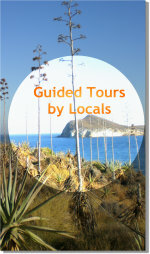 We have already booked and are looking forward to hitting more Spanish singletrack next year.